It’s a little strange having a secret life as an anonymous blogger. Although I’ve gotten used to hearing colleagues talk about things they recently read on HIStalk, I’m still not entirely used to them talking about my personal posts. I think that will be a bit easier now that I’m apparently a “non-anonymous” celebrity, courtesy of cable TV. Our hospital has had a “Focus on Your Health” outreach program for several years. It shows on the local public access channel and each episode runs intermittently throughout the month. I did a women’s health feature when I first started practice and it brought an interesting mix of new customers to the practice. I had just opened and needed the business, but the influx of people was challenging enough that I wasn’t too excited about doing it again. Last month, the hospital was looking for a piece about summer health emergencies and asked me to help out. I figured that since I now work mostly in the emergency department, it might be fun. I dutifully prepared my segment on all the various “things that can get you in the great outdoors” and prepared to film. We covered all the staples: dehydration, sunburn, noxious plants, heat-related illness, venomous snakes, and more. Most of the conversation was around prevention and the basics. Drink plenty of fluids, avoid being outside during the hottest parts of the day, wear a hat, use sunscreen. Wear long sleeves, pants, and sturdy shoes when working in the yard, woods, or garden. Not exactly hot topics. What I wasn’t prepared for, though, was the magic of video editing. While we were filming, there was a flat screen with the “Focus on Your Health” logo in the background positioned between the interviewer and my chairs. After filming, the screen was replaced with gory pictures of our discussion topics – rashes, bites, snakes, spiders, and more. Some of the footage seemed right out of a National Geographic “animals eating animals” special. I was surprised to be a hot topic in the doctor’s lounge. Apparently some of my colleagues thought I had prepared the video clips myself and wondered exactly what I do in my free time to have all those pictures. I’m self-conscious about being on film, so it wasn’t easy to hear what colleagues thought about my performance. I fretted over that for a day or two until I had my first celebrity encounter at the supermarket. I heard a little voice say, “Hey, mom, it’s the Snake Lady!” and looked around to see who he was talking about. Turns out it was me. His mom said he loved the show and recorded it. I suppose having one’s performance critiqued is worth it when you see the smile of a child meeting his TV idol. Got a story about public access television? What do you think of it as health information technology? E-mail me. 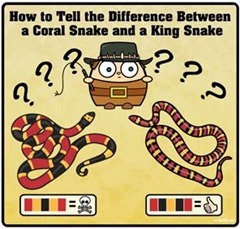 @ Dr. Jayne – Regarding the snake question in the pic – Red to Yellow = kill a fellow, Red to Black = venom lack. Now about those poisonous spiders that live under toilet seats, that’s another story. Had a patient in the ED last night who brought her printout from the internet to “prove” what bit her. Had to show her the truth on Snopes…and tell her to stop skin-popping heroin.